As someone who has spent much of his career in residential development, collaborating with leading architects and designers to create unique living spaces, there is no doubt in my mind that Fishermans Bend is the single most important urban renewal project of our generation. With population forecasts suggesting Melbourne will grow by roughly 95,000 people annually for the next 35 years - at the end of which we will almost double in size to 7.7 million residents - our city needs to look at innovative, carefully-planned infill sites just like Fishermans Bend in order to support our growing population and ensure all residents have access to the appropriate infrastructure, amenity and quality of life that have contributed to Melbourne’s ongoing status as one of the world’s most liveable cities. With Fishermans Bend forecast to house over 80,000 people and support 60,000 new jobs once complete, this 455-hectare area is a prime case study for Melbourne’s future planning policies and a key driver to support a substantial number of residents over the coming years. That’s why it has never been more important to get the policy right. Developers must take ownership of the precinct and accept that they have a responsibility to work collaboratively alongside government, planners and designers to ensure the best possible outcome for the site and its prosperity into the future. We can’t afford to let Fishermans Bend become another iteration of the Docklands. From the outset, early provision of transport and infrastructure is needed to support population growth, as well as access to schools, well thought out public spaces, medical facilities, retail and entertainments options. This must be facilitated not only by at a government and infrastructure level but also at a local level from developers through the early provision of key on-site amenity such as retail and resident amenity. Another non-negotiable is the provision of not just quality housing but a holistic mixed-use approach including commercial and hotel offerings. This ensures not only a diversity of housing types – which adds character and creates a unique sense of place – but also encourages myriad uses from daytime into night, ranging from home and work life through to quality recreation and leisure. By developing a number of opportunities for residents and workers to engage with the precinct, and by delivering them early on in the precinct’s lifecycle, we can encourage the creation of an authentic community that is the cornerstone of any new neighbourhood. In May 2016, the Victorian Government released the Fishermans Bend Recast Vision for community consultation. It identified the Wirraway precinct of Fishermans Bend as a family friendly, urban neighbourhood. Extensive amenity including cafes, restaurants, specialty retail, and small businesses will line Plummer Street Boulevard, accessible via walking and cycling routes interspersed in the area and connected to Port Melbourne. With its position bordering the established surrounds of Port Melbourne and its transport links connecting residents to the CBD, Bayside and beyond, this precinct is set to offer one of the best locations in Fishermans Bend. As a stakeholder in the Wirraway Precinct, Third Street is passionate about bringing the vision of Fishermans Bend to life, which is why our first project in the area, P.M, will be designed for the local market with a range of architecturally-designed apartments and townhouses, along with a world-class serviced apartment hotel. We envisage the hotel as a drawcard to the area, supporting local businesses and ensuring diversity in demographics and use. Our residential apartments will bring a touch of international glamour to the precinct, with extensive podium outdoor entertainment areas, a health spa, and abundant communal rooms available for residents’ use. 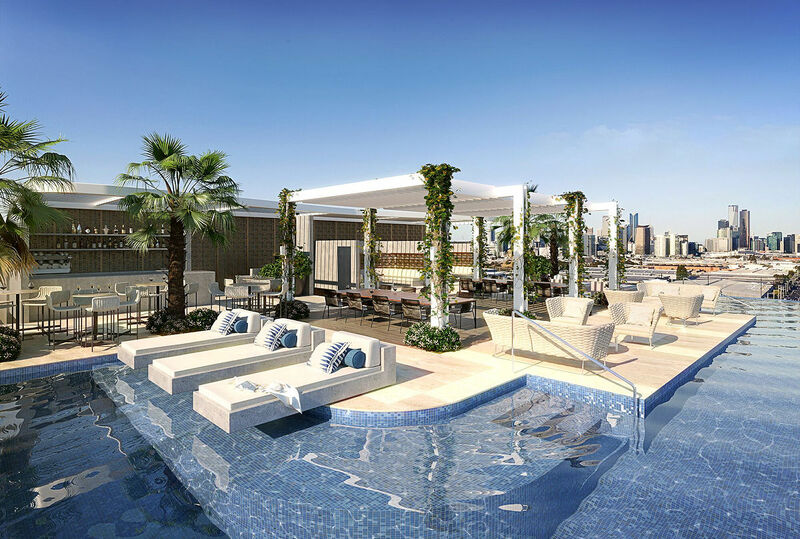 Our rooftop horizon pool and bar is quite unlike anything in Melbourne, and is inspired by the architecture of L.A.
We are committed to delivering a vibrant lifestyle precinct on the ground floor early on in the development’s lifespan, with a restaurant and bar, grocer and deli, gymnasium, and state-of-the-art business centre. Again we view this as an opportunity to encourage a wide variety of uses within the precinct and provide the kind of amenity new precincts like these depend on. In order to protect the integrity of the neighbourhood, we will be taking this vision one step further by restricting the leasing of these key retail sites to premium brands and service providers whom we feel will add real value to the precinct long-term. Not only does this help to safe-guard the vision of our project but it helps to ensure the long-term success of the precinct as a whole. It is this sort of commitment that will, if employed throughout the precinct, create the best version of Fishermans Bend and deliver a best-practice revitalisation precinct for all Melburnians to enjoy. Twenty years ago, the Docklands didn’t have a masterplan to ensure the cohesion of the project. Now, we have learnt from our past and as such, the Fishermans Bend Recast Vision sets out a tangible strategy to achieving a lively, thriving community that supports Melbourne’s future growth. In it, the government has outlined the ten key focus areas for the project moving ahead. The timely provision of infrastructure, a vibrant mix of uses and activities, a high quality built environment, a great place for families, and distinctive and diverse neighbourhoods are included in its objectives. Around the world, we have seen transformations breathing new life into former industrial sites, creating communities of strong urban character, boasting vibrant culture and dynamic lifestyles. The Meatpacking District of Manhattan, the Fashion District of downtown Los Angeles, and SoHo in London, all provide benchmarks for our industry and help visualise what can be achieved when we focus on the very best outcome for our city and its people. It’s now up to us as in industry to put our money where our mouths are and work together to deliver on this vision and ensure we all create the best possible versions of each project, in order to in turn ensure the long-term success of Fishermans Bend. David Joachim is founder and Director of Third Street, a Malvern-based property developer.